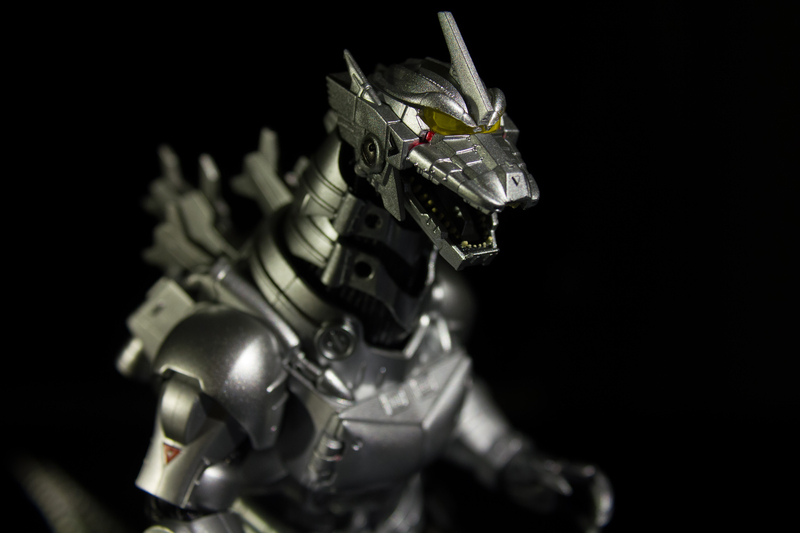 Kiryu, also known as Mechagodzilla from the Millennium era, joins the S.H.MonsterArts line and is the first entry from the Millennium era. I’ve never owned a Kiryu figure so I was pretty excited when it was announced. For those who don’t know, this incarnation of Kiryu is from "Godzilla Against Mechagodzilla" (2002). 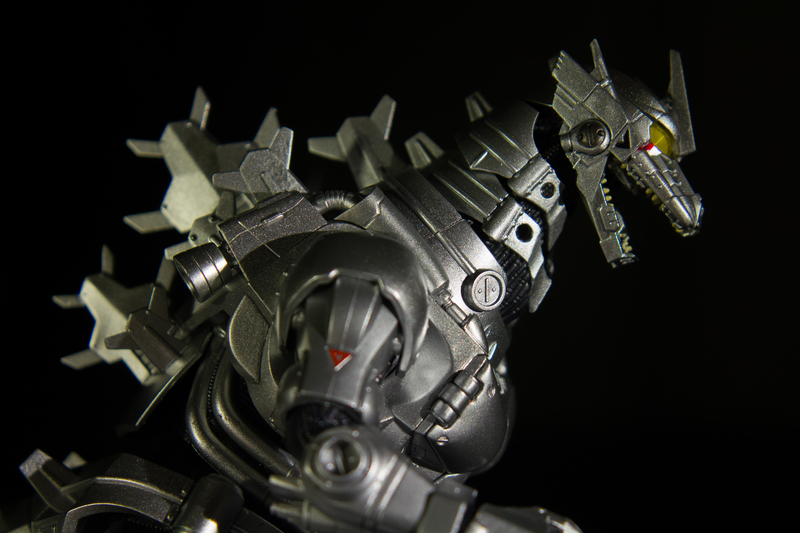 One thing Tamashii gets right with its S.H.MonsterArts line are Mechas. Kiryu is a very popular creation from the Millennium era with a lot of merchandise everywhere, from affordable to expensive price tags. Most of these figures don’t look half bad compared to their movie counterpart either. So if you have a Kiryu figure already, should you feel compelled to buy this one? 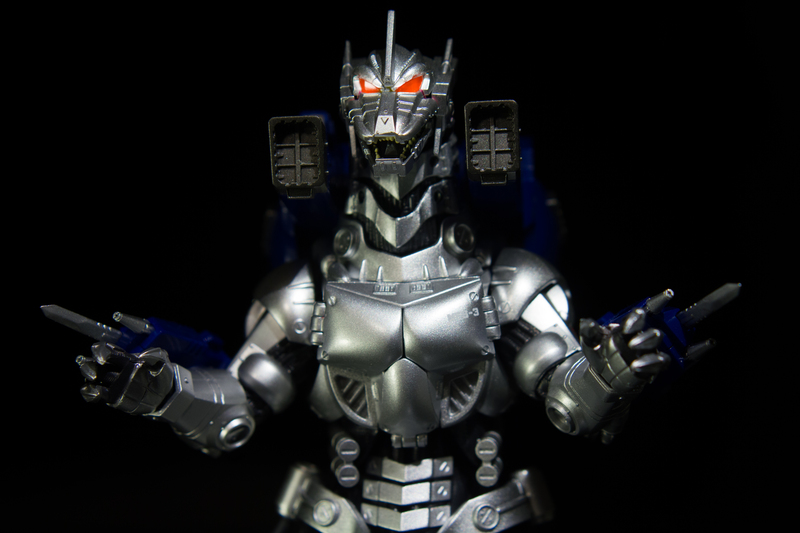 Kiryu’s design, sculpted by veteran sculptor Yuji Sakai, features a tough gun metal plastic with some parts in diecast metal to give the figure some weight. 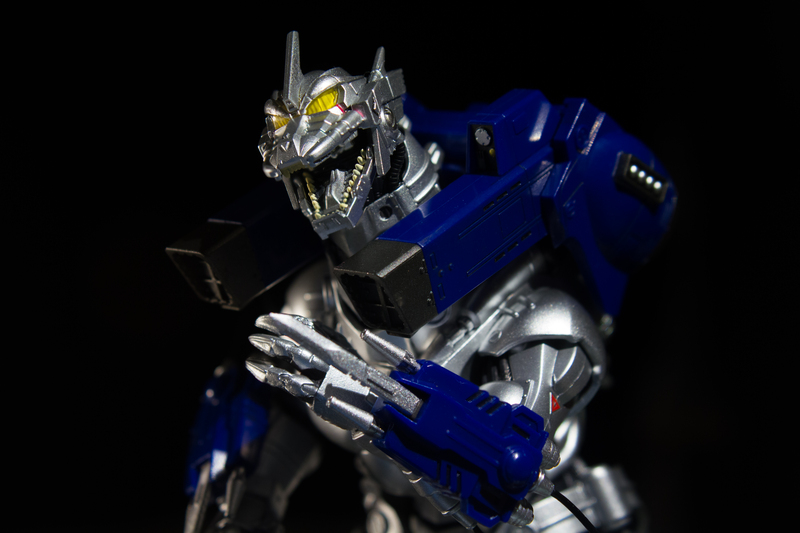 The head looks like it did in the movie and features a sleek modernized metal look. The eyes are connected to the crest of the head and are made of translucent material, giving the eyes a nice glow in some lighting conditions. Kiryu’s mouth features actual teeth instead of metallic ones. Further inside the mouth are two maser cannons. These are small, but very detailed. On the sides of Kiryu’s head there are two cables that run along the surface and into the neck. These cables are made of a soft plastic material and are able to bend depending on how Kiryu’s head is positioned. 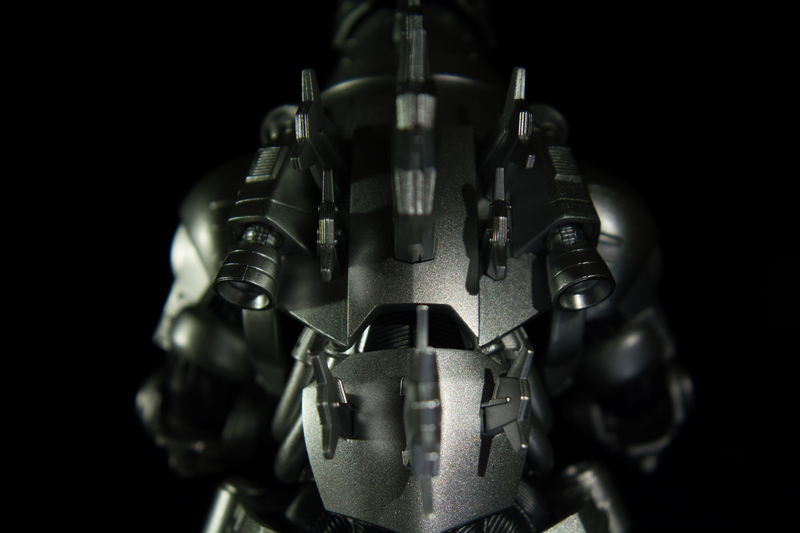 The neck and most of the frame of the body have cables that underlie the metallic armor. Unlike the two cables on the sides of Kiryu’s head, these cables are meticulously sculpted with hard plastic. I’m sure if they used the rubber plastic material the figure would have a hard time standing on its own, especially on hot summer days. While these sculpted cables don’t bend, they are aesthetically pleasing. This particularly stands out near the waist above the thighs. The chest opens up to reveal the absolute zero cannon and looks exactly like the one from the movie. The chest plate doors are made of diecast. 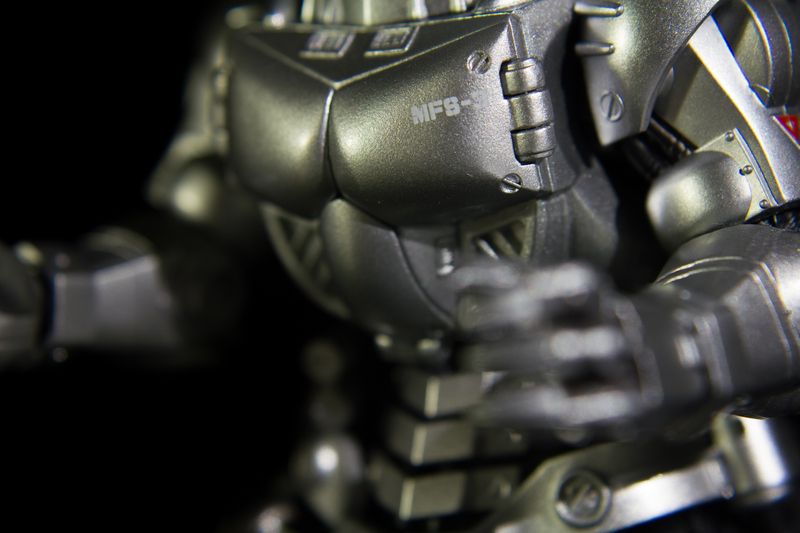 The upper right plate displays Kiryu’s model number, “MFS-3.” Under the chest there are a lot of sleek unique designs that give Kiryu a modern edge. It’s all very well done and couldn’t look any better. The arms and hands feature similar qualities and show more “muscle” than past Mechas. 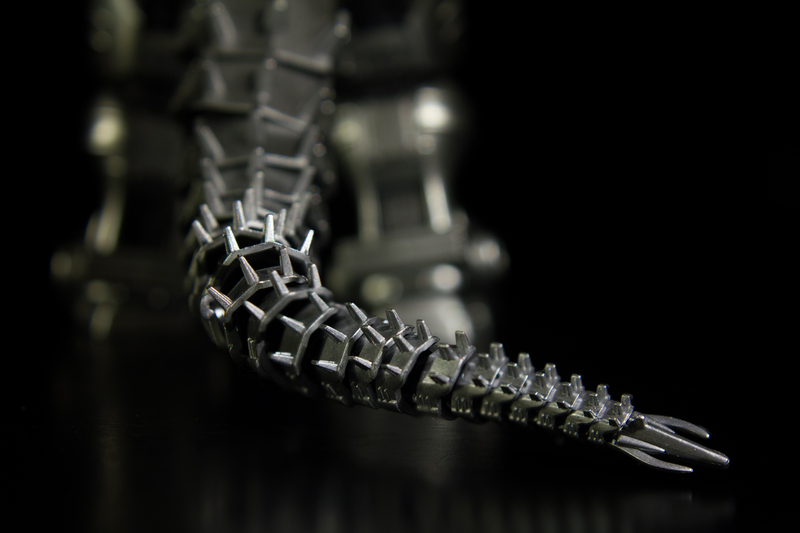 On the backside of Kiryu, all dorsal spines are well represented and even include the two afterburners. Although small, these afterburners have fine details. The mid-section of the torso is a floating piece of armor with dorsal spines, which I personally find annoying. It’s different from past monster designs in the torso area as it can get stuck executing extreme poses and must be readjusted. It’s a minor nuisance, but isn’t a deal breaker. 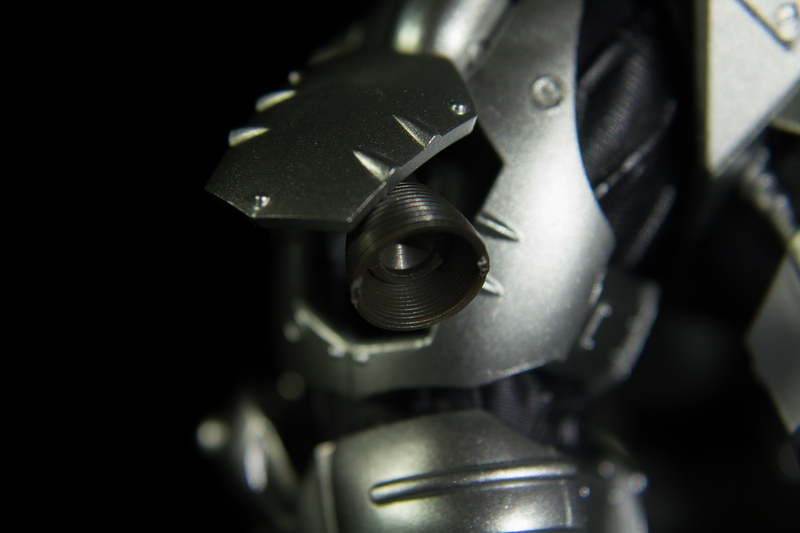 The legs feature bigger pieces of metal armor and cable parts. Like most of the design elements, they are brilliantly sculpted with a sleek modern edge. Where the thighs meet the waist are two cables like the ones on the sides of the head. These are also made of the same bendable material, allowing for free movement depending on how the legs are posed. The kneecaps are attached to the lower part of the leg, which works for neutral poses, but can look funny in an extreme bent position. It’s minor and forgivable for the sake of articulation. 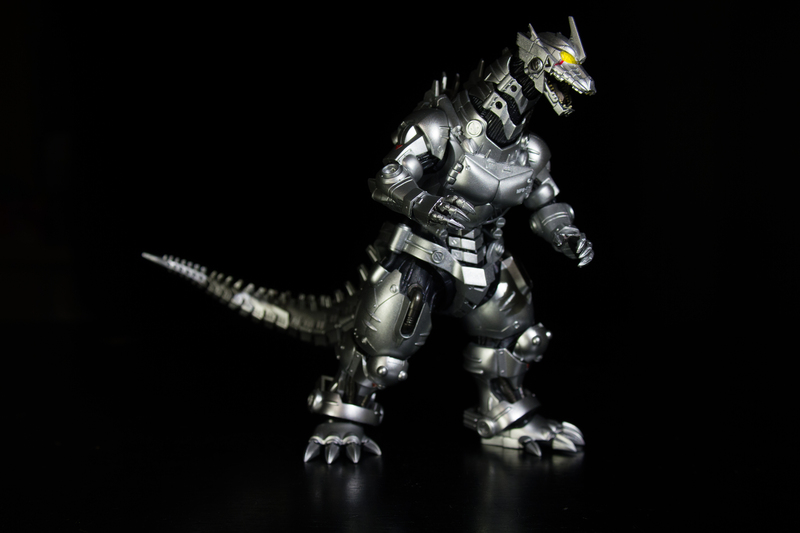 Near the feat, Kiryu shares a similar, but updated, ankle shield that was present with the Heisei era's Mechagodzilla. It’s good for hiding the gaps created by posing the feet. The feet themselves are made of diecast, adding more weight to this figure. 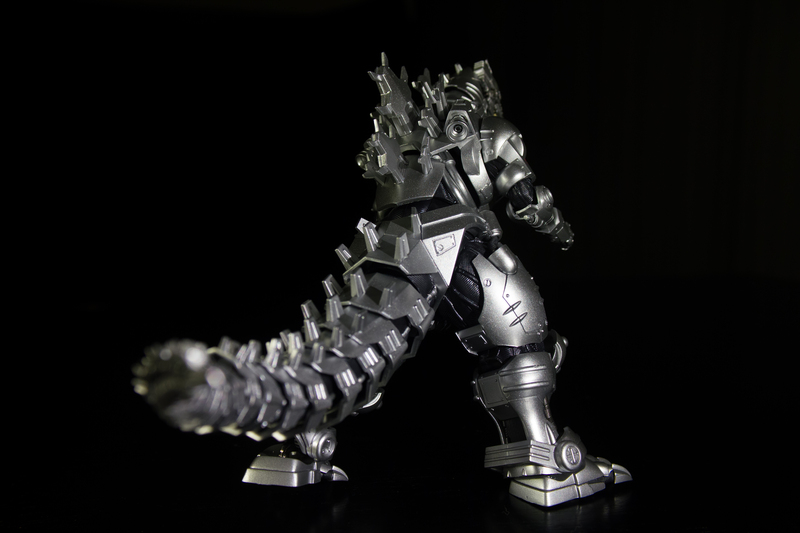 Kiryu’s tail is long and expertly sculpted, featuring three rows or dorsal spines, sectioned armor, and sculpted cable material underlying the frame. It’s my second favorite piece of the entire sculpt. Well done. Overall, it’s a strong and solid rendition of Kiryu. Kiryu offers the most articulation of the Mechas released to date. Articulation seams are not noticeable and blend at the proper points. Being a cyborg helps hide them. Kiryu uses a ball joint and peg system. 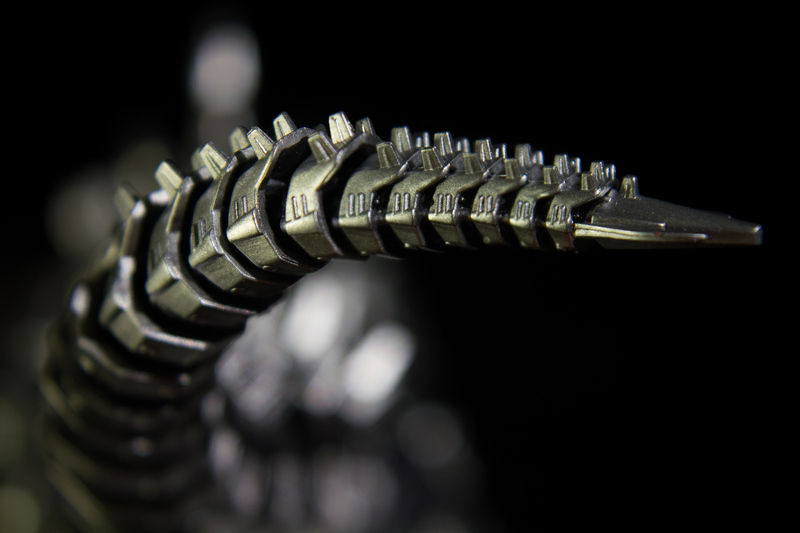 Two new types of articulation are introduced, a floating midsection of the torso and a new metal hinge joint for the ankles and feet. The head can rotate in a 360 degree motion. It’s limited looking up, but looking down has more range and allows the figure to look at its toes, emulating a nice “powering down” pose. The mouth opens and shuts as expected, however, how wide the mouth can open depends on whether it is looking up or down. Looking up, the mouth can open to its maximum potential and looking down offers about half of that. The neck can also tilt up, down, left, and right. Tilting left to right is more limited than tilting up and down. Thanks to the floating midsection, the torso has a great range of motion. While in some instances this floating piece can be nuisance and get stuck, the torso can turn a complete 360 degree motion. I wouldn’t advise doing that, but it can be done. The torso’s ball joint allows it to lean back and forward. With the combination of the floating midsection, some cool poses can be achieved. The arms offer a bit of new articulation as well. The shoulders can sag or be aligned with the body, allowing for a full range of rotation. Directly below the shoulder there is a peg and ball joint that allows the arms to lift up or down, making it versatile in many outward directions, rather being constrained to movements of the shoulder. The hands and elbows are as expected, offering a typical range of motion. The chest is able to open and shut, thanks to a simple door hinge system, revealing the Absolute Zero Cannon. Kiryu’s back also has two afterburners which have a full 360 range in motion. 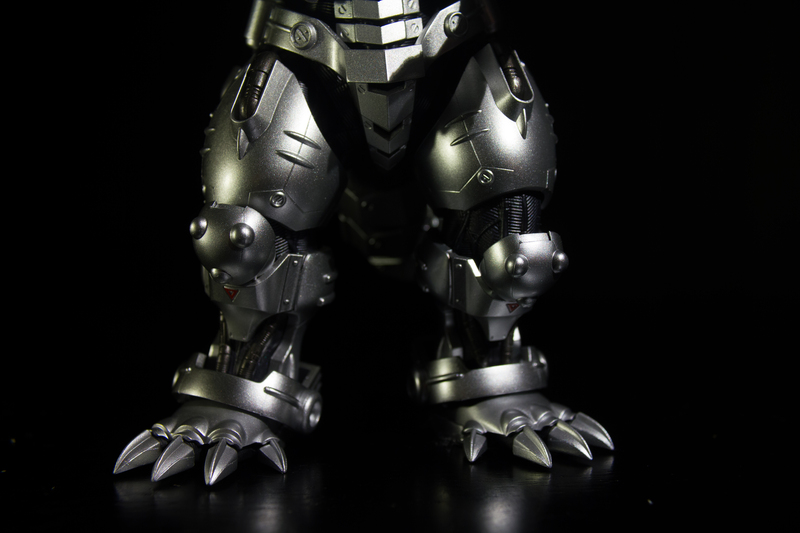 Unlike the Heisei era Mechagodzilla, Kiryu’s legs are quite stiff and have a limited range of motion. The end result is a solid standing figure without wobbly legs. While the legs are barely able to rotate, they are able to spread to create narrow and wide stances. Despite their limitations through rotation, the legs move back and forth optimally. Bending at the knees is much better than that of the Heisei era's Mechagodzilla. The feet are connected to the ankle featuring a new metal lever hooked hinge joint. This allows the foot to be posed in virtually any position. This makes up for the limited movement in the legs and allows for even more extreme poses than this line has ever allowed in a standing kaiju. This is fantastic and I want this design to continue in future releases of the line and not just in Mechas. Kiryu can easily balance on one foot with this new joint. Please, Tamashii, continue this! Another neat hidden feature are the afterburners inside the thighs. They are able to pop out, when the proper force is applied, and are able to move back and forth. The motion is not as full as in the afterburners on Kiryu’s back, but that’s because of the design. It’s as expected and a welcomed addition. 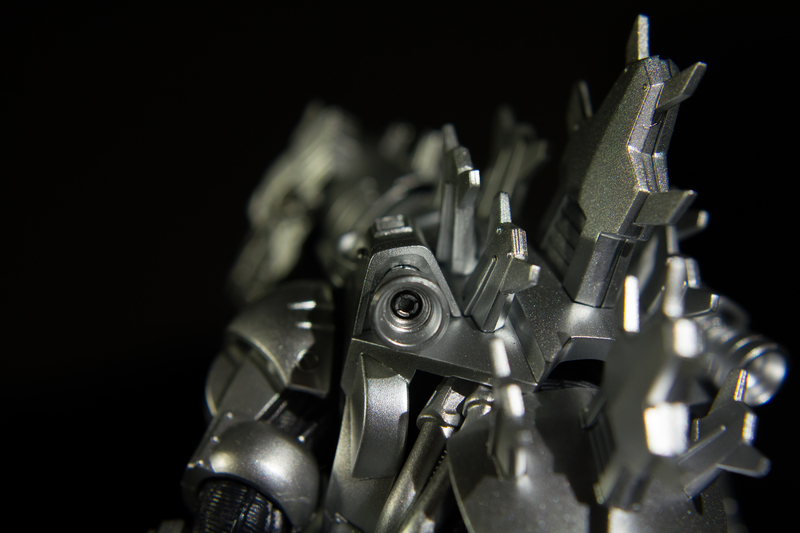 This is the first Mecha of the line to get a fully articulated tail. 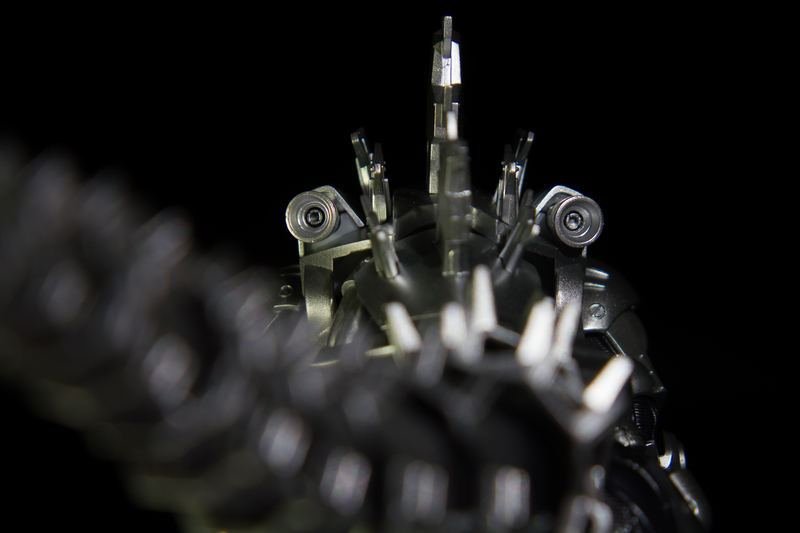 Featuring sixteen points of articulation, as many as King Ghidorah’s, the tail is very poseable. What’s great about this tail is that it can hold a pose in just about any position. Tails in S.H.MonsterArts figures, especially long ones, are notorious for drooping in certain poses, however Kiryu’s mechanical stiffness and lightweight plastic seems to keep it stable. It may also have to do with the peg and ball joint system implemented here. A continuing unwanted trend, the tip of the tail is not articulated, leaving out almost an inch of unarticulated segments. Overall the articulation in this figure is executed properly and, with the attention to balance and weight, it makes it the most poseable Mecha of this line to date, although granted it’s the third entry so far. After a long drought of next to little or no accessories, Kiryu includes some mechanical goodies. It comes with the rocket launcher backpack, two arm laser cannons with connecting wire cables, two maser blades, and three swappable eye parts. The famous rocket launcher backpack sits nicely on Kiryu’s back after you remove three dorsal spines. The launcher parts themselves are able to move up and down for a neutral and battle ready stance. The arm laser cannons connect on top of the forearms and use a cable that can be secured into the elbows for extra support. The two maser blades connect into the arm laser cannons. Be very careful as these ones can fall out if not secured properly and could be lost forever. 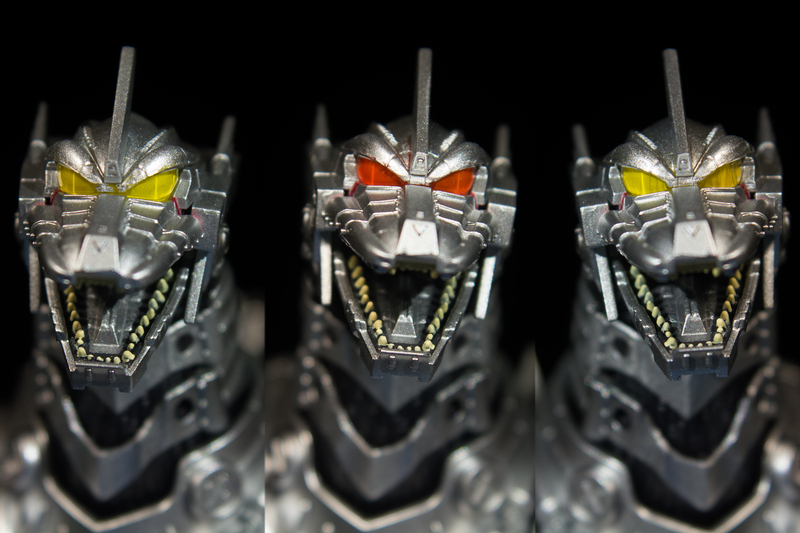 The three swappable eye parts feature different states of Kiryu from the film. The eyes shipped on Kiryu’s head reflect Kiryu’s look before it encountered Godzilla. The red eyes are from when Kiryu goes berserk remembering its past. 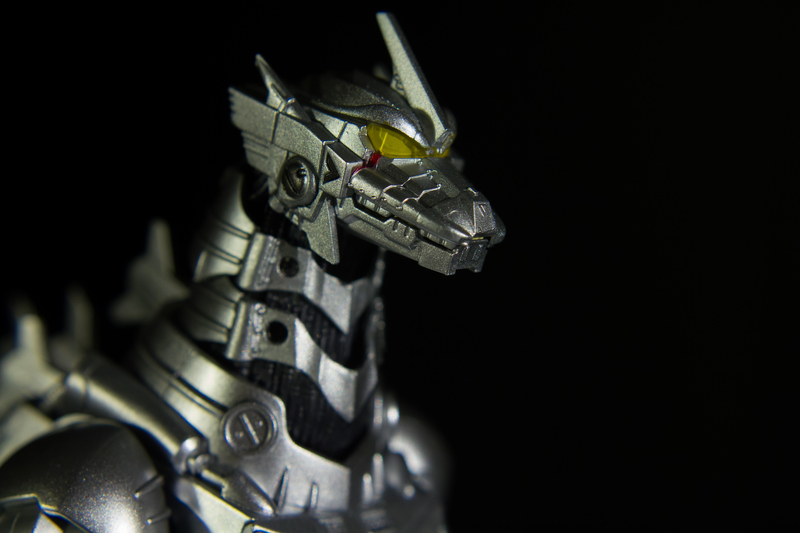 The yellow eyes with lines inside are from after Kiryu has undergone repairs from an encounter with Godzilla. It’s refreshing to get some accessories, but unfortunately Kiryu does not come with a beam effect for the Absolute Zero Cannon and the maser cannon in its mouth. An easy solution is that you can borrow beam effects from King Ghidorah and Godzilla (1994) to best emulate these weapons. Still, it would have been nice to have an Absolute Zero Cannon blast. It just feels incomplete posing the chest open without it. I feel that accessories are included with this release because it’s a Mecha unit which usually sells well in Japan and other countries. That being said, I won’t be getting my hopes up for future releases to have accessories unless they're Mecha's. Tamashii Nations is always pushing to get the best articulation and sculpt design and that is very obvious with this figure. My only concern is that they don’t keep what works and instead try something new that may not work as well. 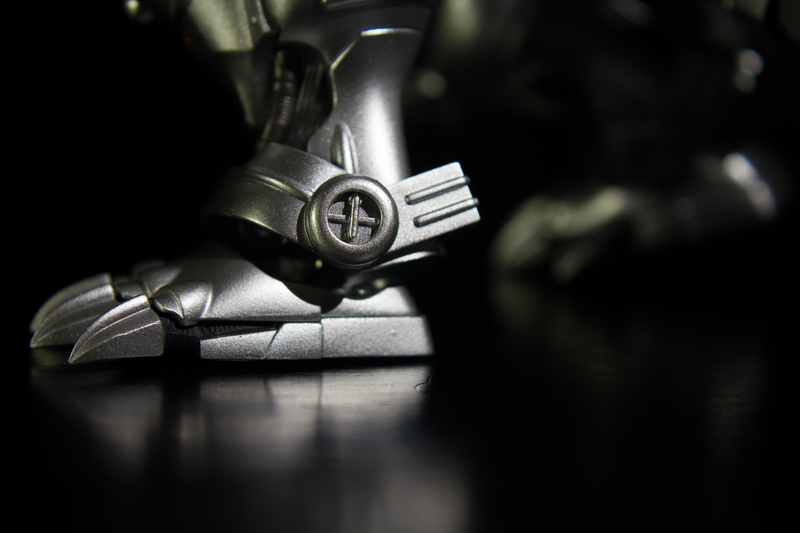 For example, Kiryu’s new ankle and foot hinge design is absolutely brilliant and should be a standard for all upcoming releases. 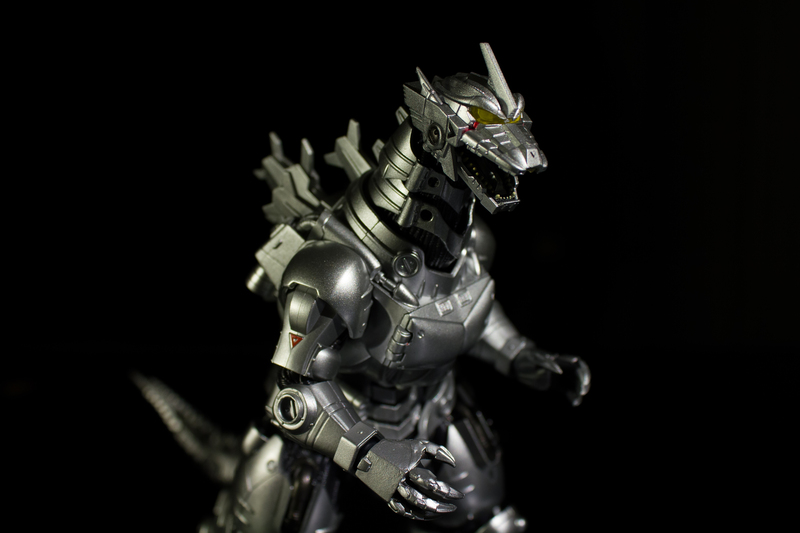 That being said, Kiryu features excellent qualities in articulation, sculpt, and paint job. It is a welcomed addition and suitable for any collector, even if you have Kiryu figures already. Priced at a hefty $96.99 MSRP, I would wait until the figure is around $70 to $80. I have seen prices for Kiryu low as $57.99, so there are great deals out there. Did I mention it comes with accessories?! Is it a must have? Yes, yes, YES! Do I recommend Kiryu? YES!!! The paint job is fantastic, even though it’s mostly silver and black. 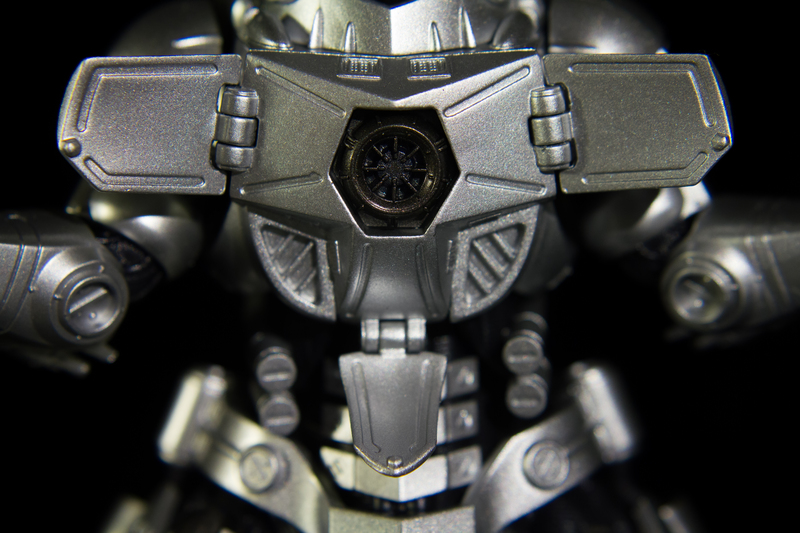 The gun metal silver reflects in the light, giving the figure different shades of silver throughout. All the cables are painted a shiny black and contrast well with the gun metal silver. The arms have two painted red triangles and the chest has a white “MFS-3” logo. The eyes are a translucent glossy yellow color. Below the eyes, the signature red line is present. Inside the mouth, the teeth are painted a yellowish white to differentiate that they’re not of a mechanical nature. Though it lacks many colors, it represents the Mecha perfectly. This is a well done paint job that doesn’t suffer from mass production issues.